January is almost here. And, with January comes the need for a new calendar. 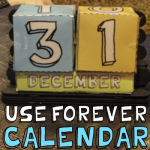 But, what if you had a Perpetual Calendar…. or another words a “Forever Calendar”? If you did you wouldn’t need to change your calendar every year. You would simply change the date everyday by rotating the numbers and the month. Well, with that being said…. today I’m going to show you how to make a Paper Box Perpetual Calendar. The craft is an easy one, but oh so useful. So, let’s get started. December is just a couple days away. And, with December comes the countdown to the Christmas Holiday. 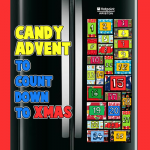 What better way to count down to Christmas than to do it with an Advent Calendar. 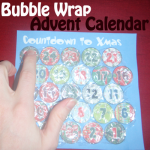 Today I’m going to show you how to make an Advent Calendar out of Bubble Wrap. What child doesn’t love popping the bubbles in bubble wrap? They love it!! So, a Bubble Wrap Advent Calendar just makes sense. It is so hard to get everything organized and de-cluttered when you have kids. If you have a lot of dates, appointments, grocery list items, messages, and other important facts straight, then why not make a family oriented family board. 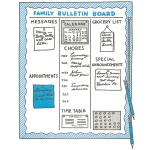 Making this family bulletin board can help you and your kids more organized and help you remember dates and other important information and appointments. Advent calenders are always lots of fun. But most of them take ages to make. Here’s a simple version of the advent calender that will take you a couple of hours to make- at the most. 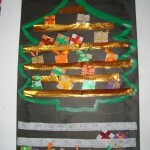 So sit down one afternoon with your kids and make this simple advent calender. Part 2 of the instructions are given below. In this page you can learn to make the Calender. Check out part 1 to learn how to make the gifts that go on this calender. Advent calenders are always lots of fun. But most of them take ages to make. Here’s a simple version of the advent calender that will take you a couple of hours to make- at the most. So sit down one afternoon with your kids and make this simple advent calender. Part ! of the instructions are given below. 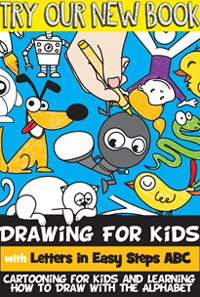 In this page you can learn to make the gifts.